Southdowns are one of the oldest purebred sheep in the world. They originated on the south down hill of Sussex County England. They are a hardy breed and are not prone to many of the problems associated with modern sheep. The larger standard modern Southdowns originated from this older miniature sheep. A few herds of the original small Southdowns were found on a few small farms around the country. 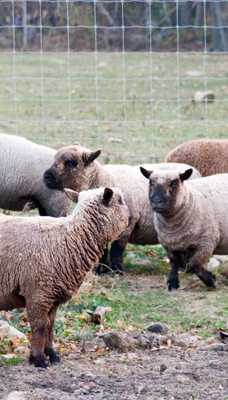 It is from these herds that the renamed Old English Baby Doll Southdown miniature sheep were bred and registered. Through diligent searching and promotion, 350 of these miniature sheep were located and accepted as the Foundation Stock for a new registry formed in 1990. After registration of the 350 Foundation Stock, the registry was closed. BabyDolls are 24" or less at the shoulder without wool. The adults weigh between 65 and 100 pounds and they come in both white (and off-white) and the rare black. They have a teddy bear look with woolly faces that appear to be smiling. The ewes are good mothers, often having twins and occasionally triplets. These little sheep make fine pets. They are not aggressive but docile with a gentle nature. Because of their small size they are easy to handle for the young and old. They do have a strong flocking instinct and don't do well as singles. They make great organic lawn mowers (along with a little fertilizer!) and unlike other breeds, they do not girdle trees and shrubs. They do well in small areas such as suburban lots because of their small size and are popular with vineyards, orchards and berry farms because they are good weeders. Babydolls are easy to care for. They need regular hoof trimming and worming every 3-4 months. A tetanus and CD shot is recommended every year. They are easy keepers and only need grass or good quality hand and a sheep salt/mineral for maintenance. Ewes require grain only when lactating.